The Home page is the one displayed after a successful sign-in. It is represented by a full customizable dashboard with a set of widgets. It is possible to customize your dashboard as you want, in order to see quickly the main data and indicators. A page is simply a display of widgets. It is possible to navigate between the pages. There is a page that is the default one: it is firstly displayed when you reach your dashboard. At start, your dashboard has a unique page called “Default”. A row is a “template” to support widgets. It is called a “row” because the template defines an horizontal set of canvas with specific widths. A page is composed by a set of rows. At start, your dashboard contains 2 rows with each 2 canvas (one large, one small). The list of existing pages is displayed on the top left of the dashboard. The current page is highlighted in blue. To change the current page simply clicks on the wished one in the pages selector. Name The name of the page. Could be updated later. Default Check this box is the page should be the default one (firstly displayed when the dashboard is reached). After filling the form, just click on the “Add” button to create the page. To edit a page, click on the “Edit mode” button (top right). Is is also possible to move a widget from a canvas to another. Put the page as the default one. Only possible if the page is not already the default one. Change the name of the page. All included rows and widgets will be also deleted. Only possible if the page is not the default one. Delete a row from the page. All included widgets will be also deleted. Delete the widget of the canvas, this last will become empty. The configuration of the widget will be lost. Add a new widget for the canvas of a row. Add a new row to the page. A page could contain 4 rows at maximum. To move a widget from a canvas to another, simple do a “drag and drop” on the wished widget. If the destination is already containing a widget, then the concerned widgets are simply reverted. Some widgets could be configured: just click on the configure icon in the top right corner of the corresponding widget panel. Only widgets with the configure icon could be configured. It is possible to quit the configure mode of a widget by clicking on the display icon . The configure and display icons of a widget are not available in the “Edit mode” of a page. This widget shows the 5 last created Initiatives according to the user permissions. By clicking on an Initiative then its identity card is displayed. This widgets shows the unread notifications of the sign in user. By clicking on a Notification then the corresponding page is displayed (depending of the nature of the Notification). Only the 5 last unread Notifications are displayed. This widget shows useful links to BizDock functionalities. This widget shows useful links to the official support page of BizDock. This widget shows all the active Portfolios for which the current BizDock User is the Manager or a Stakeholder. By clicking on a Portfolio then its identity card is displayed. This widget is not available if the current User hasn't an Employee associated to him. Seeing a Portfolio in the list does not imply that the BizDock user has the correct Permissions to see and manage it. Please refer to Portfolio's permissions for all details. This widget shows all the active Initiatives/Releases for which the current BizDock User is the Manager or a Stakeholder. Seeing an Initiative/Release in the list does not imply that the BizDock user has the correct Permissions to see and manage it. Please refer to Initiative's permissions for all details. This widget shows all the active Employees and Org Units for which the current BizDock User is the Manager. By clicking on an Employee then its identity card is displayed. By clicking on an Org Unit then its identity card is displayed. This widgets shows a specific KPI for a selected Initiative. 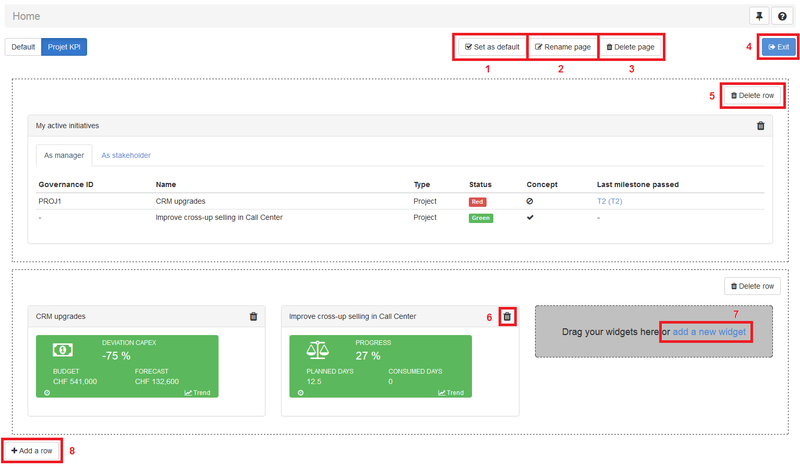 After adding this widget, the configuration page is displayed in order to select a KPI and an Initiative. For all KPI, the user should be authorized as “View complete data” (more details here) for the selected Initiative/Release. For a non-displayed KPI (more details here), the user should be authorized as “View financial data” (more details here) for the selected Initiative/Release. By clicking on a Timesheet then its details is displayed. The list of Timesheets to review is displayed only if the “Approve timesheet” is enabled. The “Approve timesheet” flag can be configured in the System preferences. The “Timesheets to review” table contains all submitted Timesheets of the employees of the sign-in user. He can directly approve one by clicking on the “Approve” button (at the end of each row) or display the details of a Timesheet by clicking on the row. It's possible to approve or reject the Timesheet (only if the status is “Submitted”, “Approved” or “Rejected”). The “Late timesheets” table contains all late Timesheets of the BizDock User's subordinates. A Timesheet is considered as late if it is “Open”, “Rejected” or “Unlocked” and concerns a past period. The number of maximal past period to consider is defined in the System preferences. For instance if the value is “5”, then the “Late timesheets” table contains all late Timesheets for the 5 past weeks. It's possible to send a reminder to the employee by clicking on the “Bell” icon. By clicking on a Budget Bucket then its identity card is displayed.